She walks along. She stops for a moment. / Like a small burning tree. 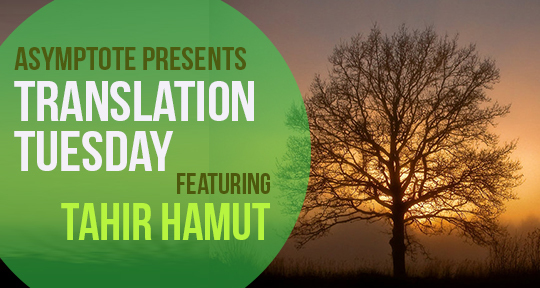 Tahir Hamut grew up in Kashgar, an ancient city in the southwest corner of China’s Xinjiang Uyghur Autonomous Region. The city of Kashgar—its fierce local pride, its layout, its customs, and its slang—has been a persistent theme in his three decades of poetic work. The three poems included here, though, were written in the three other cities of Tahir Hamut’s life, each of them a capital city: Beijing, where he completed college and worked for several years as a young man; Ürümchi, Xinjiang’s capital, where he worked as a film director for nearly two decades; and Washington, DC, where he moved with his family last year amidst deteriorating conditions in Xinjiang. While the young poet of “Her” (1993) speaks of aging and darkness, his tone is relaxed and relatively light. The poem’s unadorned style and syntax are typical of Tahir’s work from his Beijing period. More than two decades later, “Body” (2016, Ürümchi) and “What Is It” (2017, Washington) are more complex on both a stylistic and an emotional level; more troubled, too, with an insistent sense of motion. If “Her” is a moment in a young man’s private life, the two later poems are the collision of private life with forces beyond an individual’s power to control. In “Body” and “What Is It,” Kashgar and the world of Tahir’s youth are distant in time and space; but that deeply felt distance shapes the world of these poems.